Tiny Haines, Alaska, is ninety miles north of Juneau, accessible mainly by water or air—and only when the weather is good. There's no traffic light and no mail delivery; people can vanish without a trace and funerals are a community affair. Heather Lende posts both the obituaries and the social column for her local newspaper. If anyone knows the going-on in this close-knit town—from births to weddings to funerals—she does. Whether contemplating the mysterious death of eccentric Speedy Joe, who wore nothing but a red union suit and a hat he never took off, not even for a haircut; researching the details of a one-legged lady gold miner's adventurous life; worrying about her son's first goat-hunting expedition; observing the awe-inspiring Chilkat Bald Eagle Festival; or ice skating in the shadow of glacier-studded mountains, Lende's warmhearted style brings us inside her small-town life. We meet her husband, Chip, who owns the local lumber yard; their five children; and a colorful assortment of quirky friends and neighbors, including aging hippies, salty fishermen, native Tlingit Indians, and volunteer undertakers—as well as the moose, eagles, sea lions, and bears with whom they share this wild and perilous land. 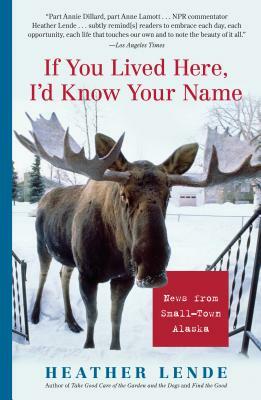 Like Bailey White's tales of Southern life or Garrison Keillor's reports from the Midwest, NPR commentator Heather Lende's take on her offbeat Alaskan hometown celebrates life in a dangerous and breathtakingly beautiful place. Find the Good, Take Good Care of the Garden and the Dogs, and If You Lived Here, I'd Know Your Name. Lende was voted Citizen of the Year, Haines Chamber of Commerce, in 2004. Her website is www.heatherlende.com.